On November 8, the PESA Emerging Leaders Committee hosted its bi-monthly leadership forum with PESA Advisory Board Member Jeff Boettiger, NAM Industry Affairs Manager at Schlumberger. Leadership forums allow member company high performers to interact with industry executives through open dialogue structured around a targeted theme. 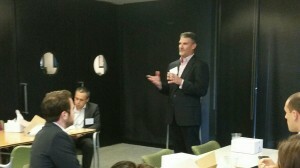 In this forum, Boettiger addressed soft skills and shared insights on leadership relating to his personal experiences. Boettiger discussed the importance of messaging and communication especially in the current environment, which tests our capabilities as leaders and team members. Reading people and situations is key and he addressed how everyone benefits when leadership makes the effort to understand the audience. The same message whether written, spoken or gesticulated can be interpreted a variety of ways, particularly when our business environment expands to include various geographic locations and cultures. Giving examples of past experiences, Boettiger shared lessons learned when interacting with different personality types and dynamics. Robust soft skills, such as the ability to read a room, have served him well over the years. “As leaders, it’s imperative to be aware of our audience and to be mindful of how messages are delivered or how words may translate,” stated Boettiger. Boettiger discussed the importance of ownership, accountability and responsibility and how implementing these principles allowed him to positively influence others throughout his career. He explained that internal motivation is inherent and cannot be taught. Allowing people to build their own plan creates accountability and encourages personal investment in the strategy. Boettiger emphasized the importance of continuous personal development and self-reflection to improve leadership skills whether on a daily basis or when transitioning into a new role. Recognizing a role’s function within an organization and continuously developing best practices is imperative to personal development. The next leadership forum will be held in January 2017.